i) We’ll annualize Indigo’s 2013 revenue, to 2.2 M.
ii) For RST, annualizing a mere 2 months of revenue (to 3.2 M) seems unwise – let’s assume an unchanged 3.0 M of annual revenue. iii) Management highlights the volume of 2013 project work (for the deployment of new GEM payment terminals to customers), and cites it as the main reason for the underlying revenue increase. They also note this level of project work may not be repeated – which I find somewhat perplexing, with the number of terminal deployments expected to increase 25% for 2014. It seems quite conservative to assume a 50% reversal (i.e. 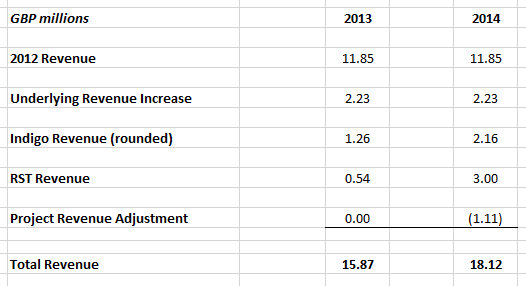 1.1 M) in the 2013 underlying revenue increase. a) Reading the results & digging into the figures, there’s no issue with SG&A – in fact, it improved to 26.1% of sales in 2013. The shortfall actually lies with gross margin, presumably reflecting lower project work margins. ii) The integration of the new acquisitions is progressing nicely, but it’s unusual to see no exceptional expense. Surely, one would expect a not insignificant level of disruption/integration cost from two acquisitions in just 6 months? Now, since we’re assuming a reduction in project work/revenue for 2014, it’s also fair to assume gross margin will improve. And we note Indigo’s actually a more profitable company (with a 20.5% EBITDA margin) than UNG, while RST was modestly profitable when acquired – it seems reasonable to presume they can, on average, approximate Universe’s own margin in 2014. We can also assume a reduced/zero level of acquisition-related expense, while the company will ideally enjoy some new economies of scale & a decent level of organic growth – all of which would provide a real margin kicker. [This is a good place to highlight management prefers to adopt a cautious outlook each year]. Overall, I’m going to make the daring assumption the business reverts to a 10.4% operating margin (almost GBP 1.9 million) in 2014. That deserves a 0.875 Price/Sales multiple. Before going further, we need to make some share adjustments. Year to date, we’ve seen some option exercises & the settlement of an Indigo deferred consideration liability, increasing the share count to 220 million shares. We should also account for potential dilution from 18 M options outstanding – some may never vest, but we’ll prudently assume 100% are exercised as of today. That would expand the share count to 238 M, with UNG receiving GBP 399 K in cash (assuming the yr-end 2.2p weighted average exercise price). NB: Assume all figures are Continuing Ops. 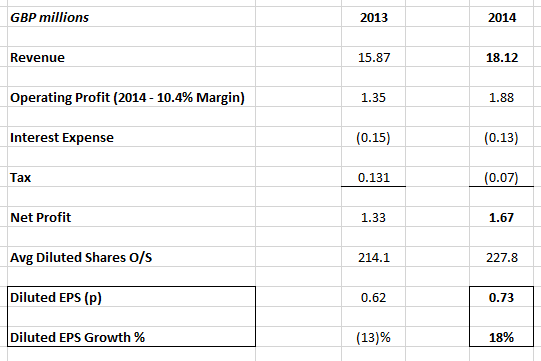 Right: Scroll up for a reminder how I derived my revenue run-rate & a 10.4% operating margin for 2014. Interest expense improves, but to a lesser degree (since no option proceeds are assumed). The tax charge is reduced due to GBP 1.4 million of un-utilized tax losses – which is probably conservative, R&D tax credits may provide some benefit. I won’t bore you with my diluted shares calculation, but it’s lower than my previous example due to averaging & the smaller number of options regarded as dilutive (for EPS purposes). This gives us a 2014 diluted EPS of 0.73p, and an 18% EPS growth rate. [Again, based on my prior revenue run-rate & a return to a 10.4% operating margin, plus no assumption for organic revenue growth/earnings]. Which looks good – the consensus estimates I’ve seen were all ’round 0.75-0.8p (Bloomberg has 0.8p). The current level of research expenditure’s almost double UNG’s operating profit!? Which doesn’t even include product development & intangibles (no goodwill) amortization. All told, the company’s R&D spend is actually GBP 3 million a year! Maybe not so much in absolute terms, but it’s a colossal 19% of sales – in comparison, the S&P 500 spends a median 1.4% of sales on R&D (and only 30% of S&P companies spend more than 10% of sales). And if you throw in depreciation (much of it spent on IT), Universe is currently devoting almost 23% of sales to (re)-investment. Judging by HTEC’s 35 year history, its leadership in the sector, plus its record of innovation, I’m comfortable betting a (major) portion of this investment will deliver an attractive pay-off for years to come – helping management to lock in multi-year recurring revenue contracts (& lock out competitors), to increase overall revenues, to expand operating margins, or a combination of all three. But the accounting rules dictate the company’s research spending must be expensed as it occurs. Now this makes perfect sense in many instances, research often has no clear objective or pay-off (Google’s ’20 percent time’) – but with Universe, we can be damn sure they hope & expect their research will lead to a product development outcome. I think it’s quite reasonable to presume this research has, on average, a 3 year life – sure, a percentage will have no obvious/lasting value, but more will have a lifetime value well in excess of 3 years. 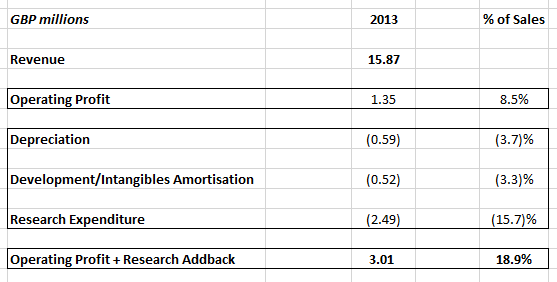 We can obviously treat all prior research expenditure as a ‘free option’ at this point, and amortize the 2013 expense accordingly (by adding back two thirds of the spend), which reveals an underlying 18.9% adjusted operating profit margin. Operating cash flow, at GBP 2.5 M, is an attractive 15.5% of sales. To arrive at operating free cash flow (Op FCF, a cash proxy for operating profit), we deduct PP&E & development expenditure. 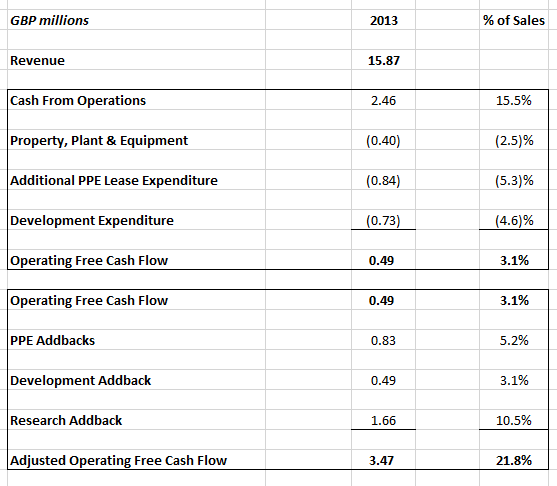 [NB: 0.8 M of (leased) PP&E’s extracted from the accounting notes, as it’s not included on the cash flow statement]. This amounts to just 3.1% of sales, since the company is currently spending well in excess of its depreciation & amortization rates. But we know this PP&E & development spending will make a necessary & valuable contribution for years to come, not to forget the contribution from the 2.5 M of research expenditure already included in cash from operations. [By necessity, I’m assuming the cash outflow for research actually equals the research expensed in the P&L]. As above, let’s add back two thirds of all this investment – to arrive at an adjusted Op FCF of 3.5 M, or 21.8% of sales. 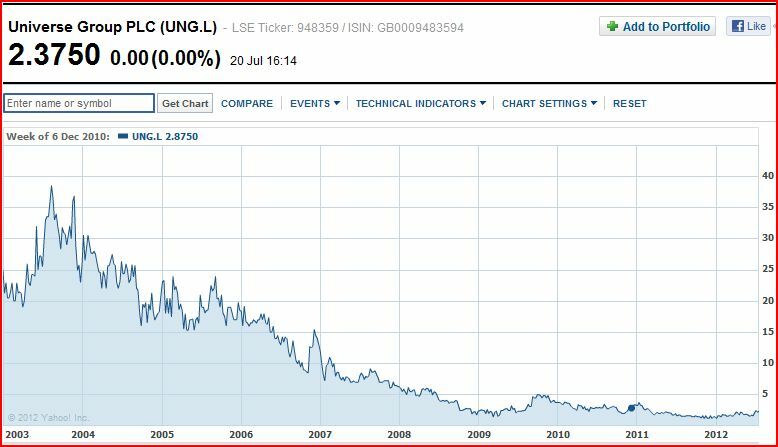 And UNG’s market cap has become increasingly interesting in this regard. Two years ago, with a sub-3 million market cap, Universe had contracts with ExxonMobil, Valero, Wm Morrison, etc. – think how much easier it is now for them to potentially win new clients & business with a market cap five times as large. And their size now brings them up on the radar for corporate acquirers – Kalibrate Technologies (KLBT:LN), a recent IPO trading on a much higher (2.2 P/S) valuation, seems like an obvious candidate (an acquisition would nicely diversely diversify product & geographic revenues for both companies). Of course, the focus on providing payment & loyalty systems to many of the UK’s petrol & convenience store retailers also identifies UNG as a potential tip of the spear acquisition for a wider universe of software, data analysis & payment companies. I’d expect most corporate acquirers would quickly capture a 20%+ operating margin – similar to the underlying margin I’ve identified – via cost savings & revenue synergies. But Universe may ultimately be most tempting to a private equity acquirer. The company offers an attractive EBITDA margin & inherently strong cash flow, while long-term recurring revenue contracts provide the perfect foundation for leveraging up the business. And research & investment could obviously be scaled back significantly without any serious or immediate impact. But that would be short-sighted, Universe’s real beauty lies in its expansion potential. Consider the geographic opportunity alone: Less than 25% of UNG’s revenues are European, presumably originating from Ireland and/or existing UK-based clients. A savvy PE investor would utilize additional leverage & the company’s existing profitability to embark on a multi-year expansion strategy into continental Europe, hand-in-hand with a UK/Irish consolidation strategy, before readying the company for a (larger/more highly valued) return to the public market in due course. Versus the current 6.125p share price, this offers 88% Upside Potential. I suspect Universe’s three major shareholders (owning 41%, in aggregate) have similar perspective(s): Ennismore Fund Management has been a dedicated long-term shareholder, while Downing LLP & Amati Global Investors have initiated/substantially increased their stakes in 2012. Despite the near-tripling of the share price, none of them have sold any UNG shares since then – in fact, Downing’s continued to add to its holding, as recently as May. 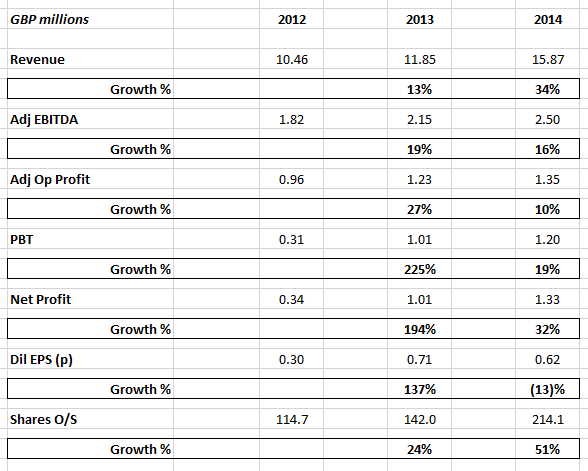 I’ve also increased my shareholding recently, from 3.2% to 3.6% of my portfolio.